MOSCOW, December 6. /TASS/. Unemployment in Russia is at a record low of 4.7%, Prime Minister Dmitry Medvedev said in an interview with Russian television channels. "This is a very important figure - this year, at the moment, we have an unprecedented situation with unemployment, the lowest figure - 4.7% according to the International Labor Organization," he said. Real disposable income of the population in 2018 will grow by 1.6%, wages - by 7.6%, he added. "There is quite strict statistics on this subject. For a long time incomes have fallen due to the crisis because of all sorts of restrictions and problems. In the last two years they have started growing. These are really objective economic figures. Real disposable income of the population this year will grow by 1.6%. 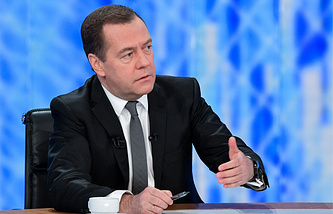 Growth of real wages, not nominal, will reach 7.6%," Medvedev said. Inflation in Russia in 2018 is likely to reach 3.5% and will not exceed the target of 4%, he said. "I cannot but note low inflation, it is a recent achievement. This year we are likely to reach a figure of around 3.5%. In any case, we are within the 4% that we have set for ourselves a few years ago. We have reached the target for inflation, which allows people to easily plan their incomes and expenses," Medvedev said. Russia expects to reach 2% economic growth per year by 2020, he said. "In order to evolve further, we, of course, need other growth rates, which we have outlined in the main areas of government activity…By 2020 we will strive to reach higher growth rates of around 2%, and 3% in 2021. We need to strive for growth rates at the global level. Although we must admit that because of the large trade war that has unfolded in the world, global growth rates have fallen too," Medvedev said.